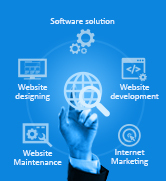 AK IT Services has a highly professional team for website development, website designing, software solutions, website maintenance and internet marketing etc. You can hire dedicated professionals from us and get access to the required skills either at your place or at our place. We provide both onshore as well as offshore services.We bring all our expertise and domain knowledge in software applications and web development. AK IT Services create and build a high quality Data recovery mechanism. Data is an important document in every field of life. Imagine that you are on your computer at work when suddenly all of the lights go out and the computer shuts down. AK IT Services started or rather had placed their first stepping stone with Web Application Development. Our expert team has done all the hard work and knowledge sharing to accomplish various levels of application development projects. AK IT Services create and build high quality websites, web applications and software systems, based on customer specifications. Our professionals are experts in extracting the real benefits out of projects, focusing on the key areas of website design, e-commerce, SEO. Copyright © 2010 AK IT Services.